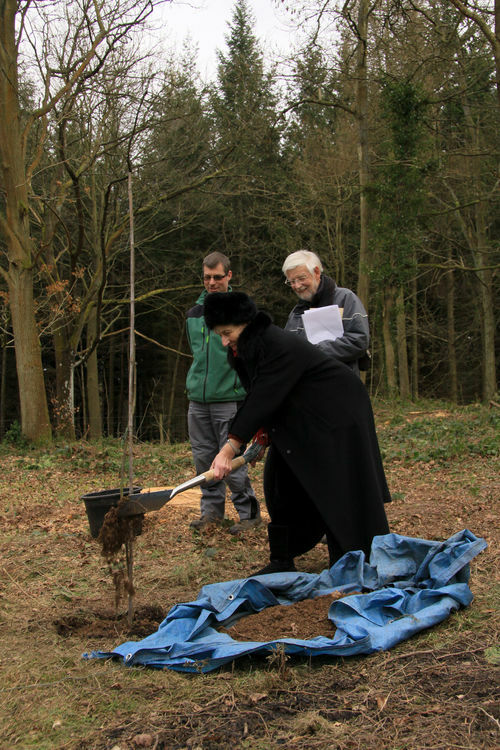 On the 14th March 2013 Hermione Gerry planted a sapling Sorbus domestica, a Whitty Pear, in the Wyre Forest arboretum near to another originally planted 30th March 1916 (01). The 1916 tree had been planted at the site of the original Whitty Pear first seen by Pitt in 1677, documented in 1678, and burnt down in 1862. 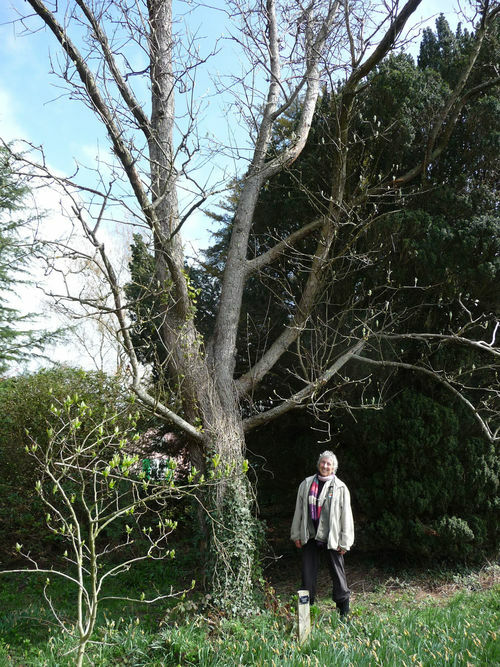 Seeds or cuttings from the original tree were propagated at Arley Castle and both the1916 tree and the 2013 tree are descendents of the original tree. For hundreds of years people speculated on the origins of the lone original tree: was it a native or planted? The discovery of Whitty Pear trees growing in South Wales and on the Severn Estuary in the 1980s and 1990s have probably strengthened the view that Sorbus domestica may be a scarce native tree but the true origin of the Wyre Forest tree remains unknown (Hampton 1996 , Hampton & Kay 1995). The 1916 tree was planted by Mrs Robert (Mary Ann) Woodward in memory of her son killed 9th May 1915 during the First World War. She was Hermione Gerry’s (née Woodward) grandmother (Gerry 2012). I first met Hermione and Andrew Gerry in late 2010 at Areley Cottage. 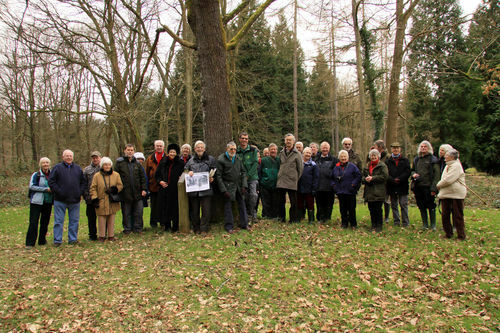 Hermione was joint owner of Pound Green Common which was for sale and the meeting was to discuss the possible purchase of the Common by Worcestershire Wildlife Trust. In conversation I was astonished to discover that she was part of the Woodward family who once owned Arley Castle and of her connection with the Whitty Pear. On another visit in April 2012 Andrew and Hermione showed me a Whitty Pear planted in their Arley Cottage garden in 1930 by Hermione’s father (02) and also a sapling they recently planted. They also showed me a sturdy sapling raised by them and growing in a pot. Where should it be planted? After various suggestions it occurred to me that in would be interesting for Hermione to plant it in the Wyre Forest Arboretum near the 1916 tree planted by her grandmother nearly 100 years previously. I asked Richard Boles, Area Forester Wyre, if this would be possible and he said it would be. He and Wyre Forest Wildlife Ranger Phil Rudlin were very helpful, leading to a ceremonial planting on 14th April 2013. 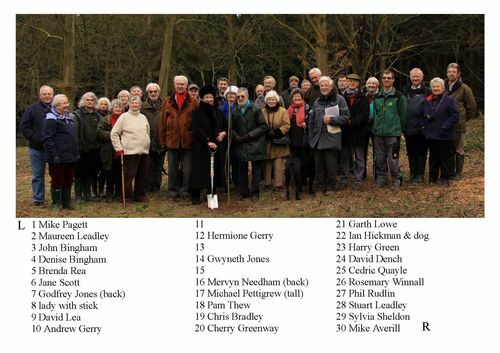 Those present at the ceremony included Hermione and Andrew Gerry with family members and friends; representatives of Worcestershire Naturalists’ Club, Worcestershire Wildlife Trust, Wyre Forest Study Group, Wyre Forest Society, and the Forestry Commission. In the photograph (03) there are a few people I have been unable to name so please let me know of you can identify them. Everyone present also gathered by the 98 year old 1916 Whitty Pear planted by Hermione Gerry’s Grandmother (04). Members of the Worcestershire Naturalists Club (WNC) often visited the original Whitty Pear and many were involved with the 1916 planting. One of their senior members present at the 1916 planting wrote a historical account of the tree (Jeffery 1916). The picture (05) from the Berrow’s Worcester Journal pictorial supplement 8th April 1917 was rediscovered and printed in the Transactions of the Worcestershire Naturalists Club in 1981 together with the caption probably written by the editor Mary Jones. Although there is a list of WNC members present she was only able to identify a few of them in the picture. Any help in naming the people in the picture would be very useful. Readers may wonder why we did not wait until 30th March 2016; a century after the 1916 tree was planted, before planting the sapling. There were two reasons. First the sapling in the pot was quite large and needed planting-out. Secondly, Hermione had been ill for some time and receiving chemotherapy for cancer. Without a word being said of this it was apparent she wanted to plant the tree as soon as practically possible. Hence, we planned for March 2013 in the 98th year and it was so. Sadly, Hermione died on 19th July 2013 and I very much hope the tree will grow and thrive as a lasting memorial to a remarkable lady. Lastly, the meeting at Areley Cottage in 2010 concerning Pound Green Common eventually led to the Worcestershire Wildlife Trust becoming the owners of in December 2013. I am very grateful of the help and support given by the Wyre Forest Forestry Commission office, especially Richard Boles (Forester) and Phil Rudlin (Wildlife Ranger) and for Richard’s permission to plant the Whitty Pear in the Wyre Forest Arboretum; also my grateful thanks to Wendy Carter for photographing the event so well. Gerry, Hermione. 2012. Sorbus domestica, the Woodward Family Connection in Worcestershire. Worcestershire Record 33:67-68. Hampton, Marc 1996. Sorbus domestica L. – comparative morphology and habitats. BSBI News No 73 pages 32-37. Hampton, M. & Kay, Q. O. N. 1995. Sorbus domestica L., new to Wales and the British Isles. Watsonia. 20:379-384. Jeffery, F.R. 1916 The Wyre Forest Sorb Tree Worcestershire Naturalists’ Club Transactions Volume VI part III pages 250-257. Jones, M. M. 1981. 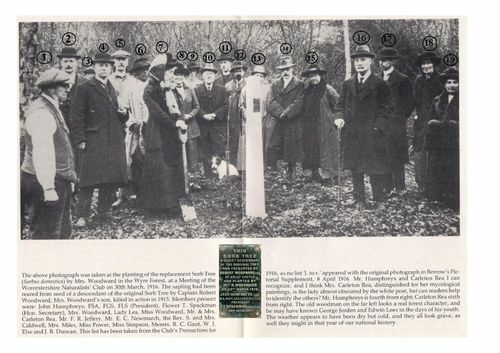 [Editor’s caption to the picture of the 1916 planting]. Transactions of the Worcestershire Naturalists’ Club. New series, volume 1, part 2, pages 96-97. Pitt, Edmund. 1678. Extract of a Letter from Mr. Edmund Pitt, Alderman of Worcester, a Very Knowing Botanist; Concerning the Sorbus Pyriformis. Philosophical Transactions (1665-1678) Vol. 12, 1677 - 1678, No. 139 April, May & June 1678, pages 978-979.